It is almost impossible to live anywhere in Bangkok that is not within walking distance of a som tum (grated fruit or vegetable salad) vendor. While street food lovers frequently rhapsodize over the best bowl of noodles or grilled hunk of meat, it’s som tum that most often finds itself at Thai tables. And what som tum it is. Although the grated green papaya is the variety that is most popular in (and out of) Thailand, vendors display a wide range of fruits and vegetables with which to make this salad, from cucumbers and long green beans to tart gooseberries and green bananas. The truth is, anything with any sort of crunch is a good base for a grated spicy salad. It’s the dressing that usually stays constant. 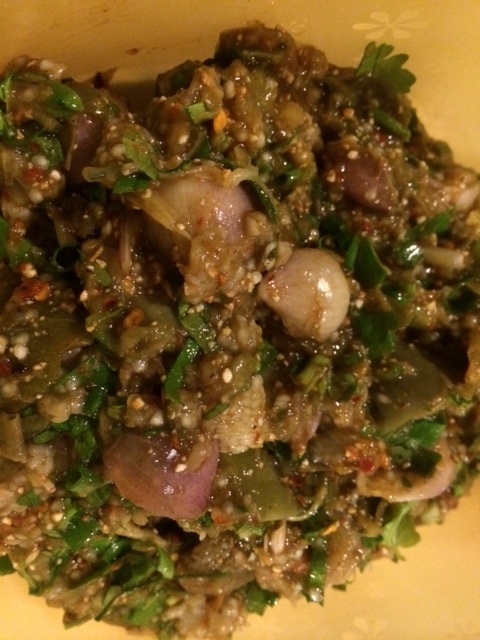 Som tum Thai — the type most commonly eaten in Bangkok and abroad — is the kind we are exploring here, with a dressing made of lime juice, fish sauce, and a healthy dose of sugar (be it palm or granulated). A light dusting of roasted peanuts and dried shrimp and you’re done. But if you are the adventurous sort who does not shy away from fishiness (really, the essence of Thai food), there is som tum Lao, tinged with that extra oomph afforded by pla rah, or fermented Thai anchovies, or even som tum nuea (the northern Thai variety), flavored with a bit of nam poo doo (the juice of pulverized and fermented field crabs). I am not a fan of som tum Thai, which I find to be too sweet throughout much of the capital nowadays, but I do have plenty of time for the Isaan version, made with either crunchy fruits or vegetables, or mua (confused), which includes kanom jeen (fermented rice noodles). 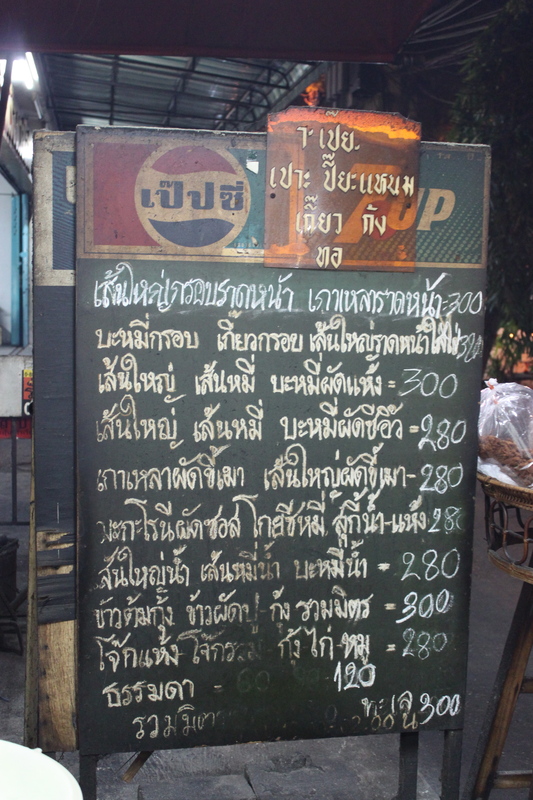 The som tum Lao and som tum mua shown above hail from Jay Gai, also known as “som tum yib bat” (som tum where you must pick a number), such is the popularity of this stand on Naresuan Road in Udon Thani. 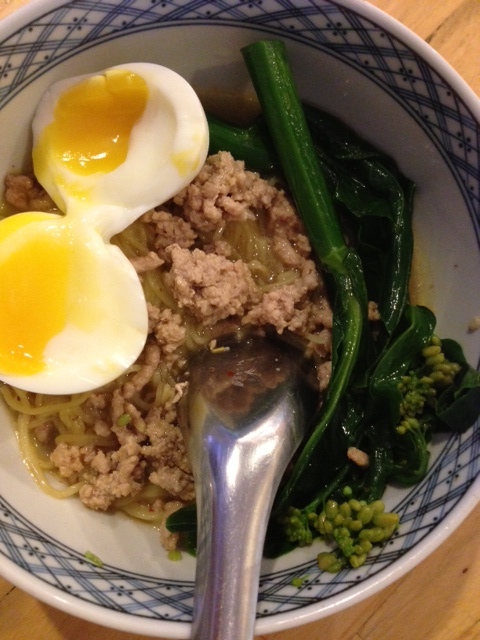 Their som tum Lao is rich in anchovy flavor, with a nearly rancid tinge; the som tum mua includes green papaya, bamboo shoot, cherry tomatoes, long beans and snails alongside the kanom jeen. 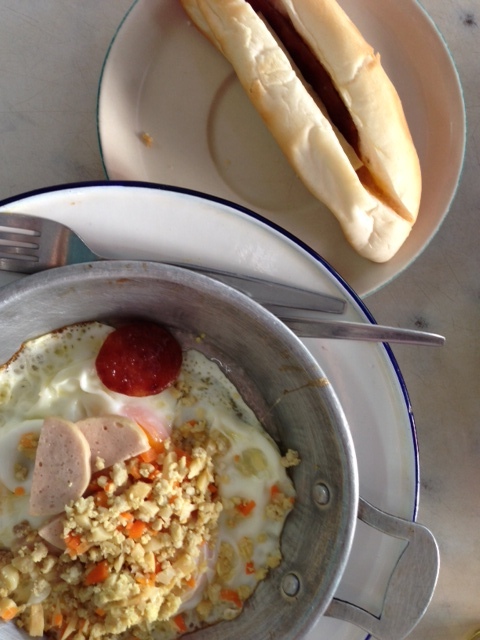 Both are what you expect Isaan-style som tums to be: thick, heady, uncompromising. That’s not what we’re doing here. Chris and I are starting with the basics, by trying to emulate Jay Gai’s “Thai-style” som tum. With Western cooks in mind, we are using shredded carrot and daikon radish in place of green papaya. The only thing we may be copying from Jay Gai is its propensity (and everyone else’s propensity) for MSG (pong chu rot). 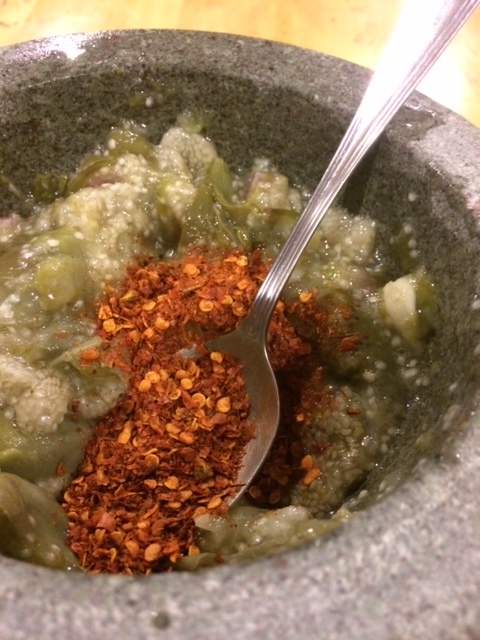 In the bowl of a mortar with a pestle, pound 3 cloves of garlic with 1-3 Thai chilies (vendors call each chili a “met” and ask customers how many “met” they want in their som tum. Answers usually range from none (“mai sai prik“) to five (“ha“). Mash into a paste. 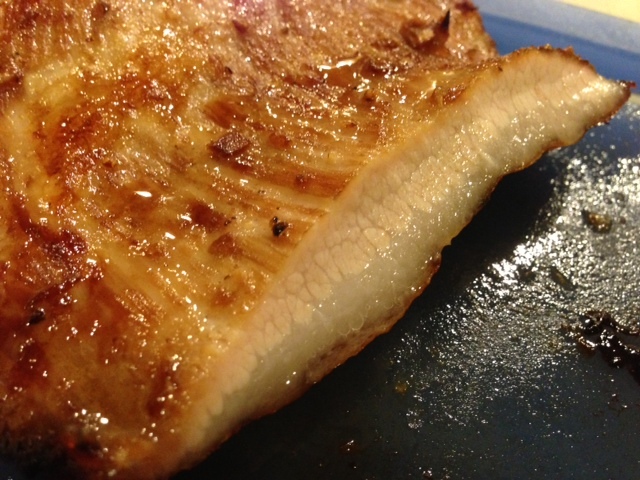 Add 3 Tablespoons fish sauce, the juice of 2-3 limes, and a Tablespoon of palm sugar or granulated sugar. Taste to correct seasoning. This is your last chance to fix the dressing before all the other ingredients are added to the mortar. Add a cup of granted carrot, half a cup of grated daikon radish, 3 inches of long beans cut into 5 cm pieces, and 3-5 cherry tomatoes. Mash gently with your pestle to ensure the strands get bruised (nothing is worse than too-crunchy pieces) while scraping the bowl with a large spoon with your other hand. It’s your decision to add Ajinomoto (to taste) or not, but every Thai I have spoken to insists that it is an essential ingredient, so there it is. We used a light sprinkling on our finished salad before garnishing with crushed roasted peanuts and dried shrimp (both to taste). A platter of fresh veggies — sliced green beans, a wedge of cabbage and some cucumber spears — accompanies the salad. 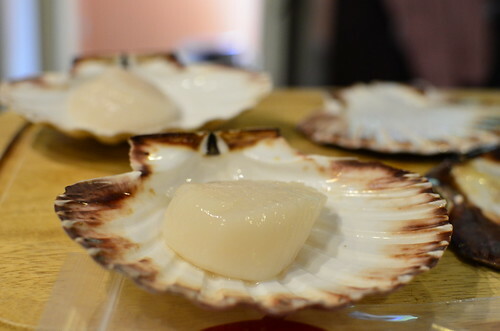 If you want to be really traditional, serve alongside sticky rice and grilled chicken or pork shoulder or, if you want to be like Jay Gai, a bowl of boiled snails. It was an interesting proposition: turn out some recipes inspired by my favorite street food stalls. Of course, I would never get the exact recipes from these folks, however lovely they are; in the street food world, recipes are family heirlooms, to be guarded as insurance for the next generation. Instead, the recipes we end up with would be approximations, wild guesses, stabs in the dark — love letters to the originals in the hope that imitation really is the sincerest form of flattery. To aid my on my quest, I enlist the help of my friend Chris Schultz (http://christao408.xanga.com), one of the best home cooks I know. We would do a total of 15 dishes over the course of three months. Some would be simple, chosen for their (expected) ease. Others would take more work refining. All would, eventually, hopefully, fingers-crossedly, be delicious. 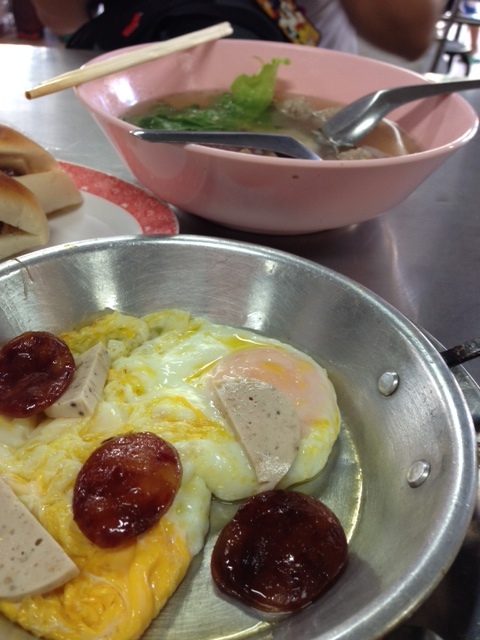 There is no question that Jay Fai (327 Mahachai Rd., 02-223-9384) is one of my favorite street food vendors. A middle-aged lady in a woven beanie and a slash of lipstick, Jay Fai plows through an extensive repertoire of made-to-order favorites, solo and with the help of two searing hot woks. 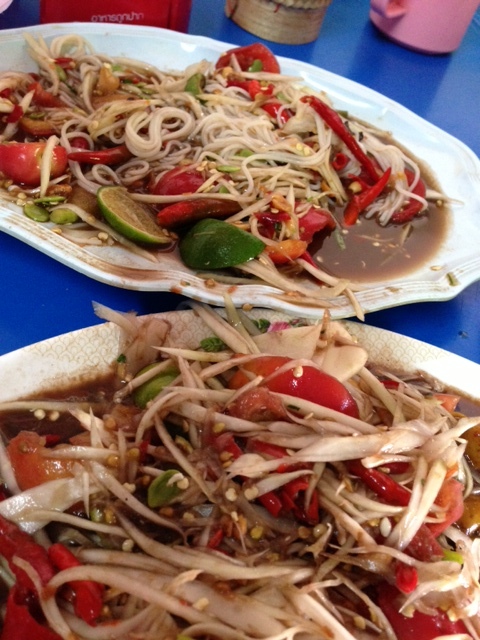 Her fried noodle dishes are to die for: punters frequently argue over which is her best, wavering between her “drunken noodles” (guaythiew pad kee mow, so called because the grease and spice are good hangover remedies) and her crispy noodles in seafood gravy (guaythiew lard na talay). Her crabmeat omelet, currently holding at 900 baht/serving, is a Japanese-inspired eggy roll stuffed with mammoth chunks of white, juicy crabmeat; hers is the only kitchen in town to serve a “dry” congee (jok hang), a gelatinous splay of broken-in rice grains topped with a tumble of shredded ginger and scallion. I could go on. 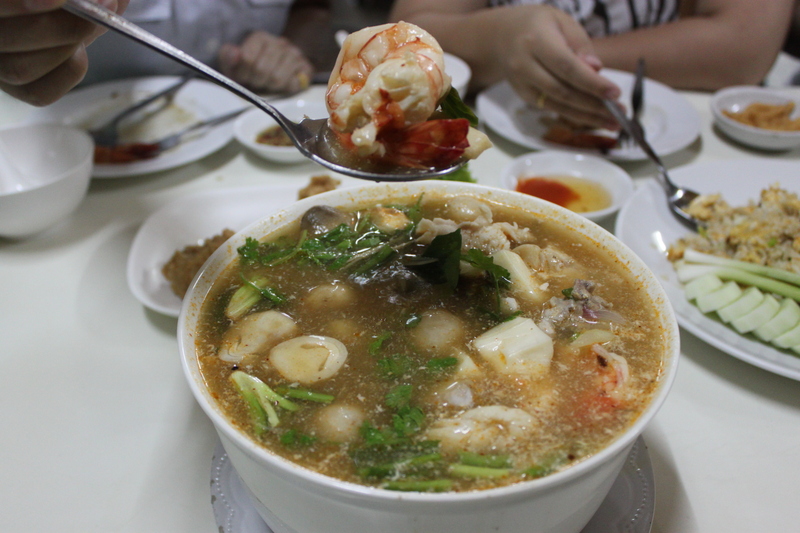 But it’s possibly her spicy lemongrass soup with prawns (tom yum goong, priced at an astronomical 1,500 baht/bowl) that intrigues me most. 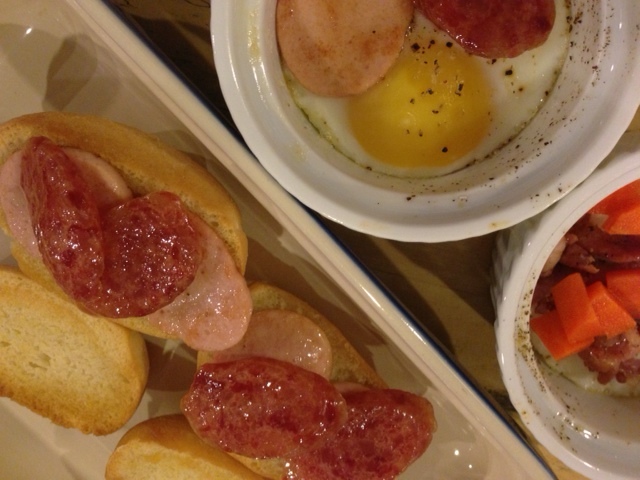 It’s a dish that everyone knows, but I suspect few bother to tinker around with. 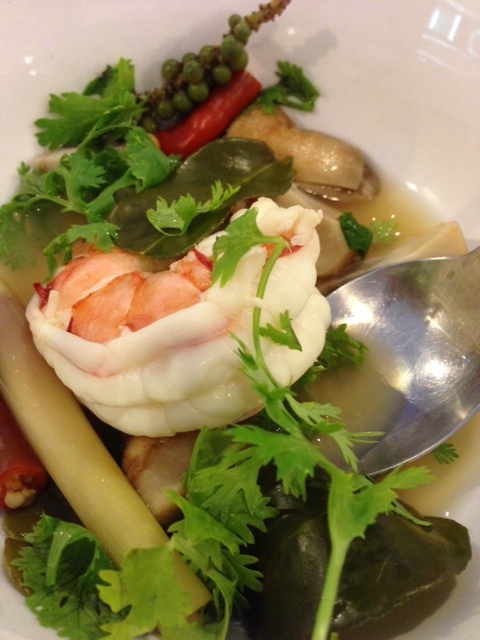 Have you ever made a tom yum? I ask because, despite the “infusion”-style broth that simply calls for throwing a handful of bruised herbs into water at a rolling boil, this soup is hard to excel at. Boil 6 cups water, toss in a handful of bruised galangal, 7-8 kaffir lime leaves, 4 bruised lemongrass stalks , a shallot or two, a couple of green peppercorn branches and 4 chilies; a few minutes later, throw in 3 Tablespoons fish sauce and at least 3 limes’ worth of juice, take your pan off the heat, and add your 8 cleaned and shelled jumbo shrimp; stir around in the muck until your shrimp blush a deep red, then garnish with coriander leaves — this is tom yum made the traditional way. Yet the flavor is … underwhelming, warmed-over Lean Cuisine after two days in the refrigerator. Where is the heat? Where is the tart? I was missing the fireworks, but without sticking an entire forest of dreck into the broth, what was I to do? The verdict: I can’t hope to replicate even half of the flavor Jay Fai gets with her tom yum by doing a straight-up infusion. There is a chili paste in there somewhere. In the coming days, I will pound fresh chilies, garlic, shallots and herbs with my mortar and pestle and see where that gets me; I’ll also roast the chilies, garlic and shallots before pounding a second batch and compare the two. 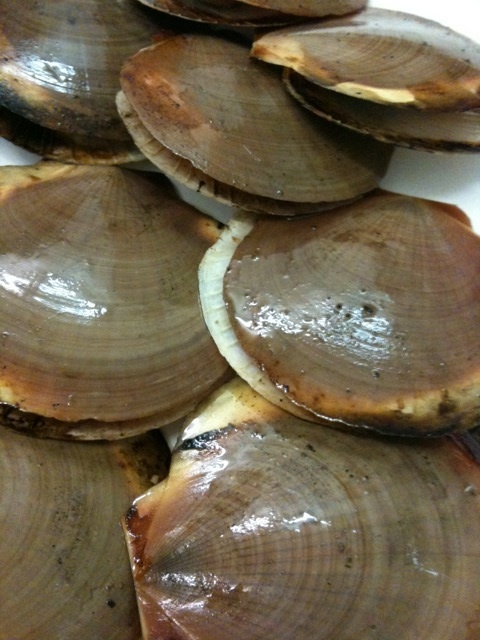 I’ll try another with roasted chili paste (nam prik pao), and in yet another, I might even add a dash of coconut milk. What do you think? There is a grocery store’s worth of places where this can go. Until then. The leftovers beckon.